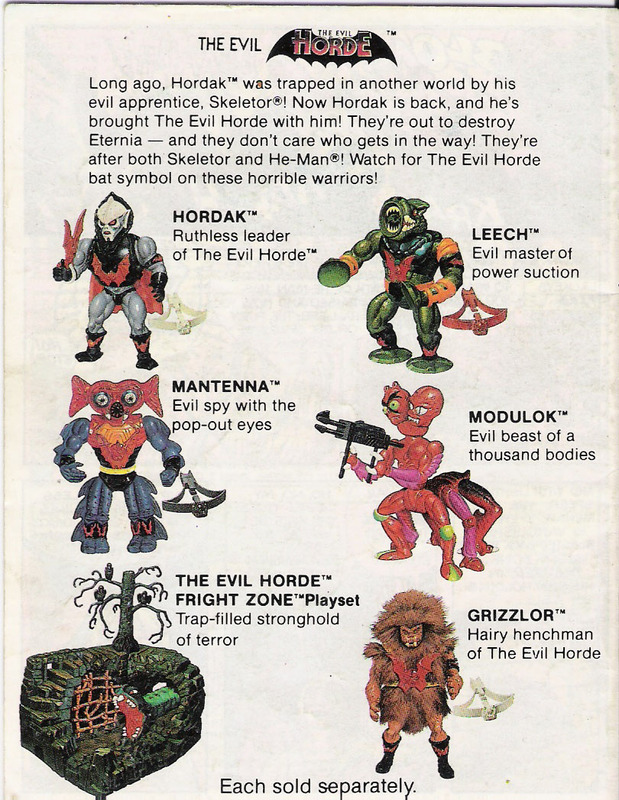 The last Masters of the Universe figures I would ever get as a kid were Rokkon, Stonedar and Modulok, for my birthday in 1986. By this point I was really getting into G.I. Joe. Colorful characters like the B.A.T. (which was kind of a Roboto clone), Viper, and Serpentor (he fit right in with the MOTU Snake Men) had finally pulled me over to the Joe side. Despite that, I was always happy to get a few more He-Man characters to add to my collection. Modulok had come out in 1985, of course, but the figure was new to me. 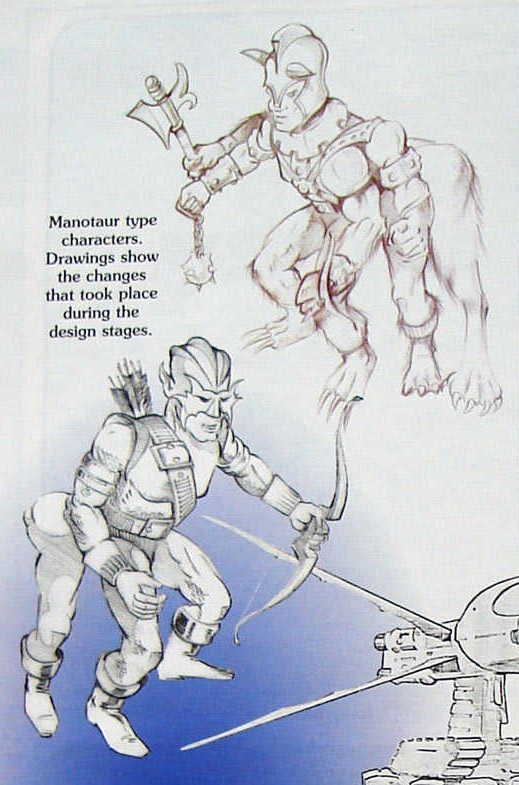 Over the years, Mattel designers toyed with several centaur-type designs, with four to six legs, and in at least one case, four arms. 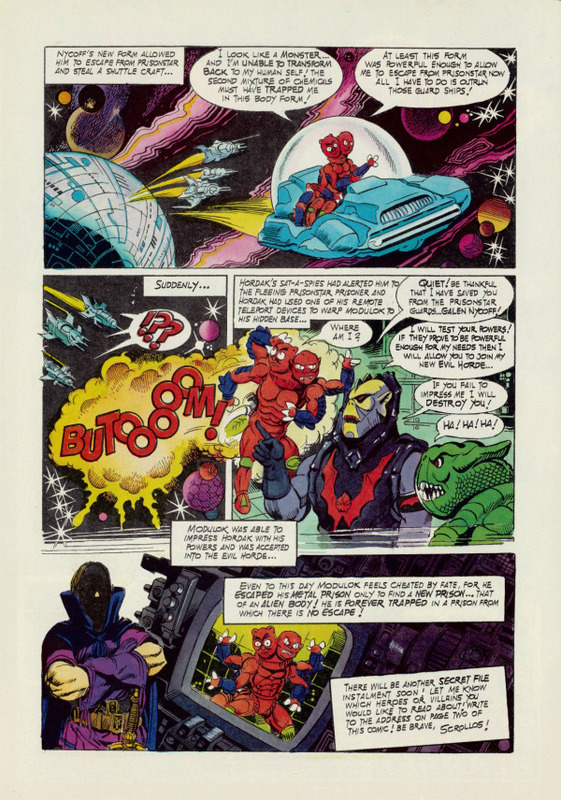 Image source: Tomart’s Action Figure Digest. Scan via Jukka Issakainen. 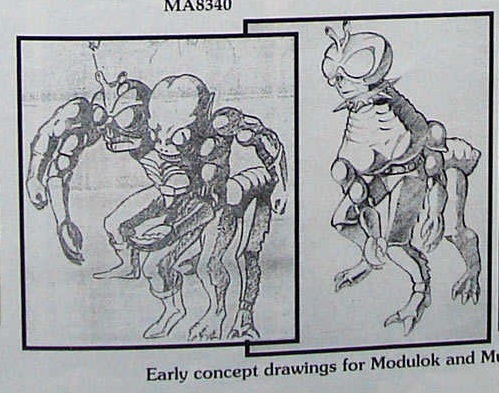 The concept/mini comic Modulok featured a set of crab-like pincers, a set of He-Man-like legs, a set of Skeletor-like legs, and a set of insect-like legs. It may be that the designer (which I believe was Ted Mayer) intended for Modulok to reuse these parts to cut down on costs. Image source: Tomart’s Action Figure Digest. This version has one set of human hands and one set of claw hands, like Modulok. Image courtesy of Ted Mayer. This version has two sets of clawed hands and lacks the Horde symbol of the black and white version. 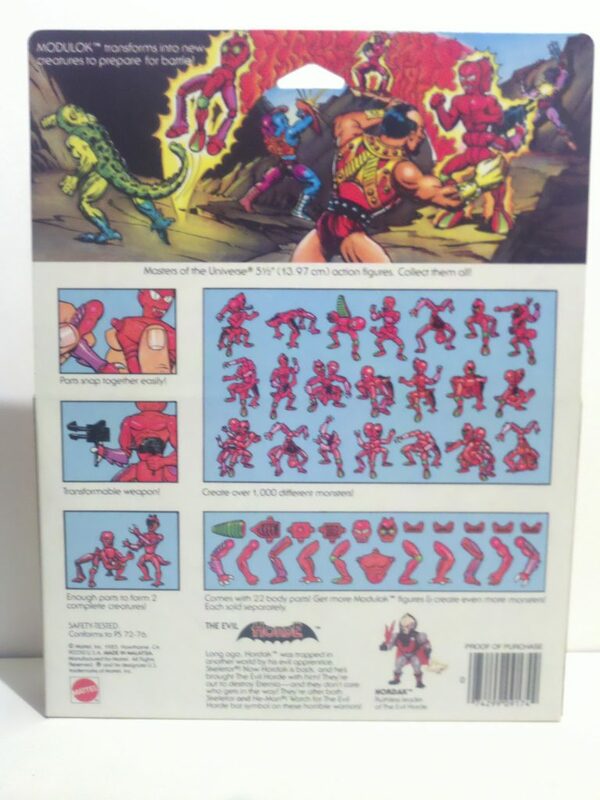 The final toy came with no shared parts at all (unusual for MOTU at the time, but characteristic of Evil Horde figures), and his build was much slimmer than any figure that had come before, with the exception of Teela and Evil-Lyn. Rather than crab-like pincers, Modulok was given three and two-fingered claws, in addition to his set of human-looking arms. 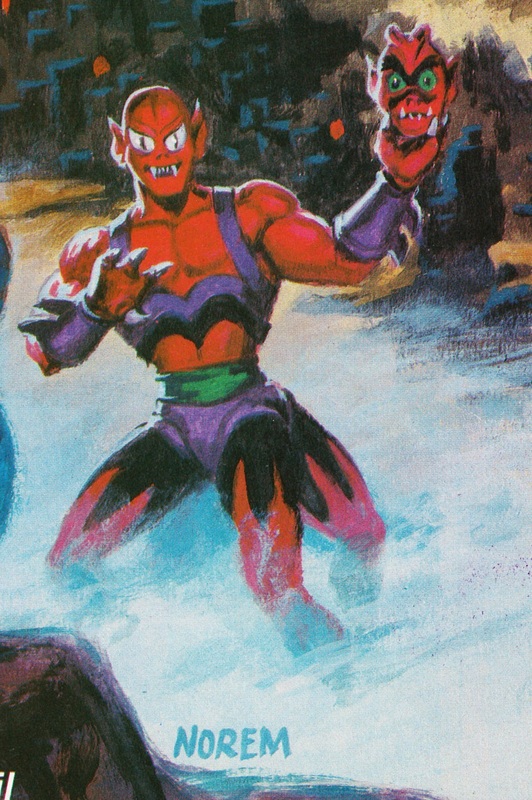 Rather than Skeletor or He-Man legs, he was given one set of human-like legs with green knee pads, one set of legs with a kind of grasshopper-like design, and another set of legs that recalled the design used on Clawful and Buzz-Off. His overall look is something like a Martian crossed with an ant. 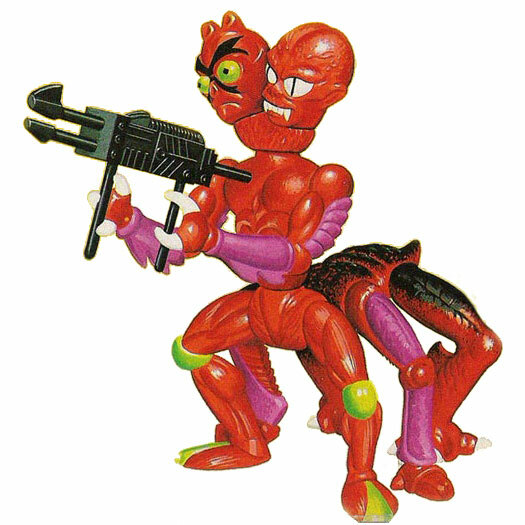 Modulok included several segmented thorax pieces, giving him an ant-like look when they were connected. 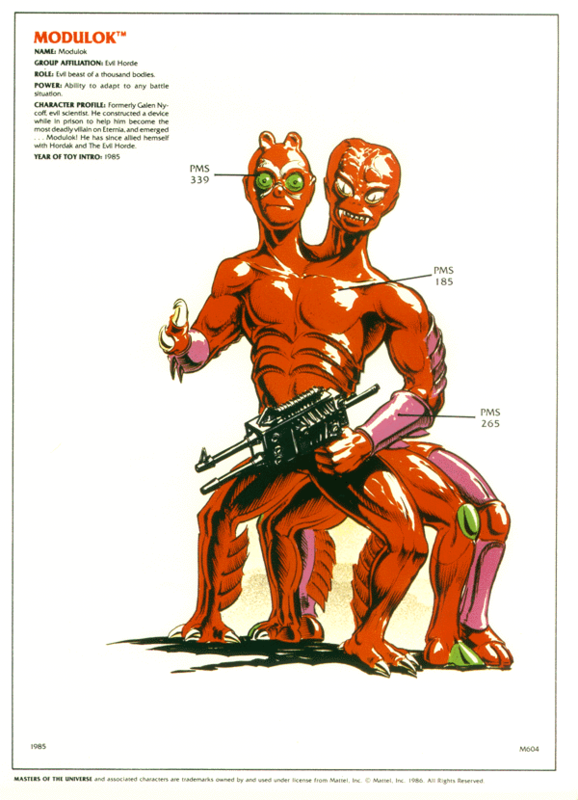 He included the two heads from the concept drawing, along with five two-pronged connectors that could be used to give the figure various head, arm and leg combinations. He came with two tails, one of which could support legs or arms. He also came with a double-sided laser rifle that could be split into two pistols. 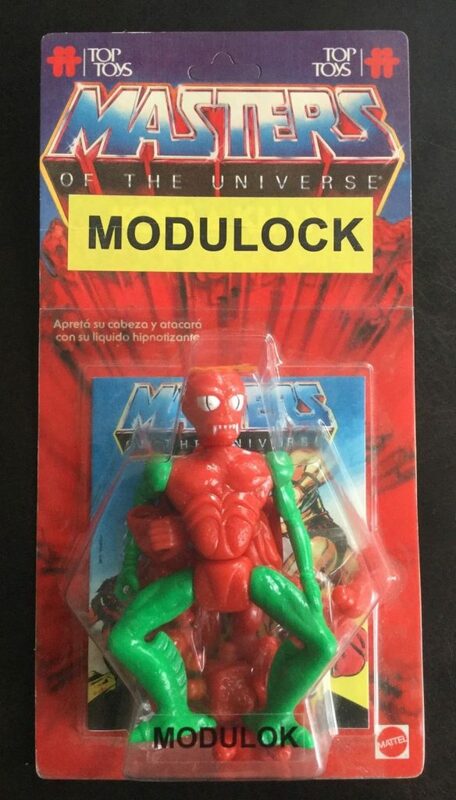 Modulok has one of the more clever names in the MOTU toyline. It’s a marriage between the words “modular” and “lock”. His construction is modular, his pieces lock together, and the hybrid word certainly sounds like a credible name for a villain. 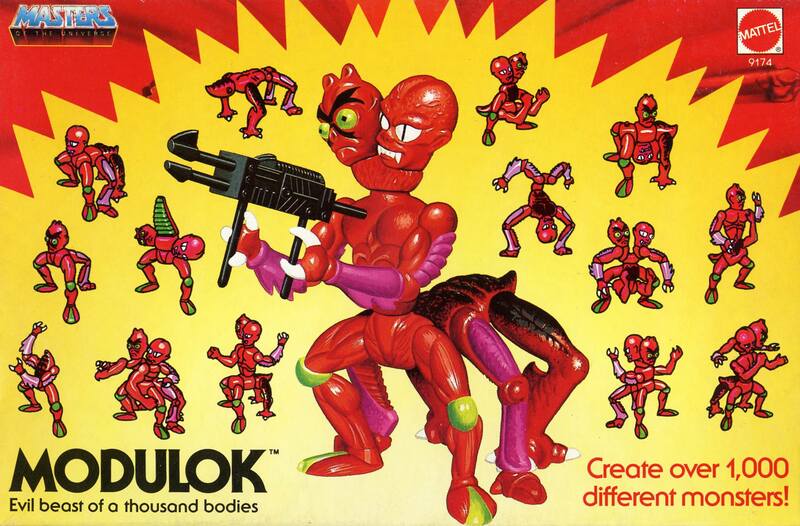 The artwork on the box Modulok came in was very true to the overall design of the toy. However, where the action figure featured dark blue paint on some of his arms and legs, those parts were colored light purple in the box art. 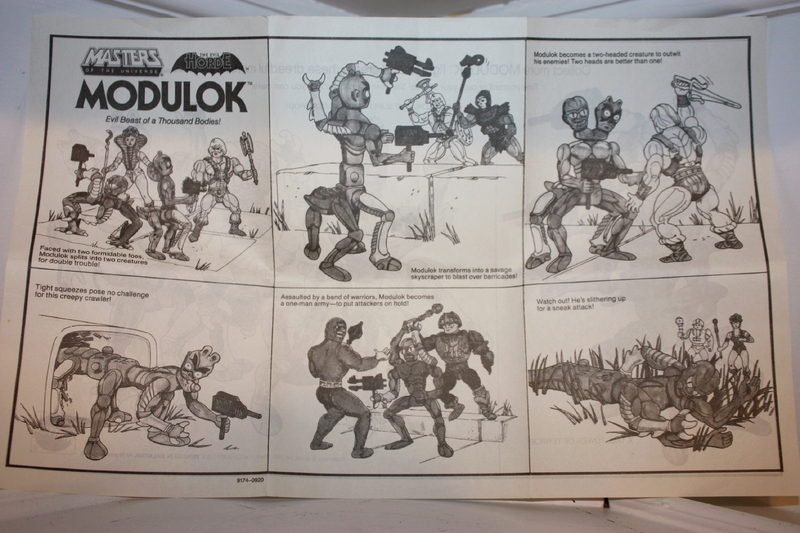 The front and back of the packaging featured illustrations of Modulok in dozens of different configuration. The idea, I’m sure, was to help kids engage with the toy more by giving them many different ideas for play. I think I eventually tried out all of them. 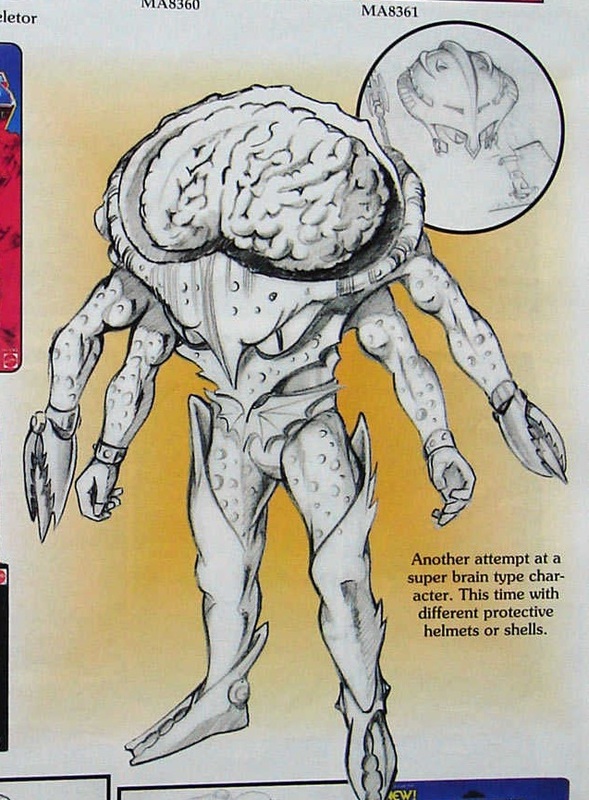 The instruction manual that came with Modulok provided even more ideas for putting him together in bizarre new ways, including some ideas that would require purchasing multiple copies of the toy. It was a bold attempt by Mattel’s marketing department to move more units, I’m sure, but I don’t know that many parents would have been convinced to buy the same toy two or three times over. 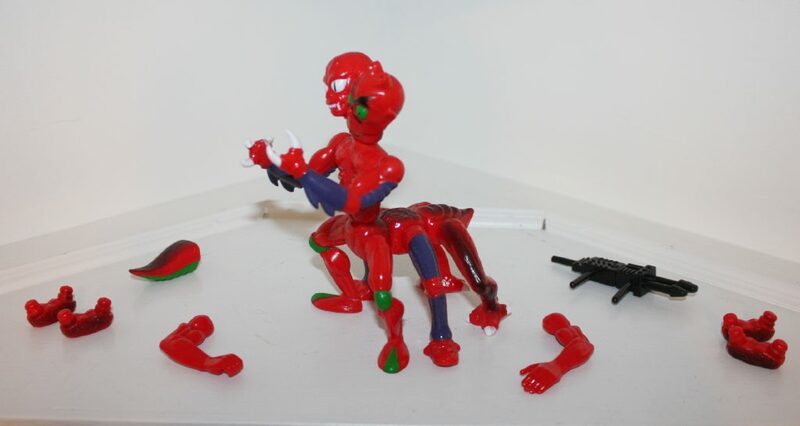 Argentinian manufacturer Top Toys produced a version of Modulok that was packaged on the standard sized blister card. 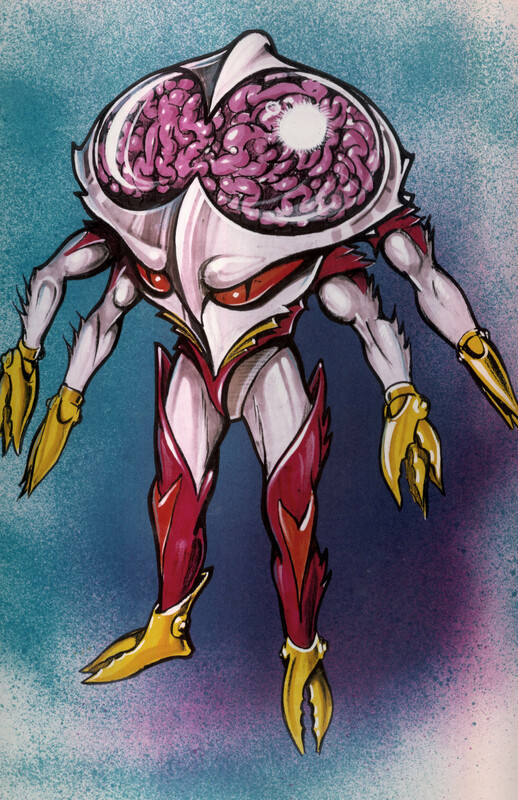 Since there was no such card set up for Modulok, Top Toys reused the cardback from Kobra Khan. The figure itself came with green limbs and is highly sought after today. The Treachery of Modulok! 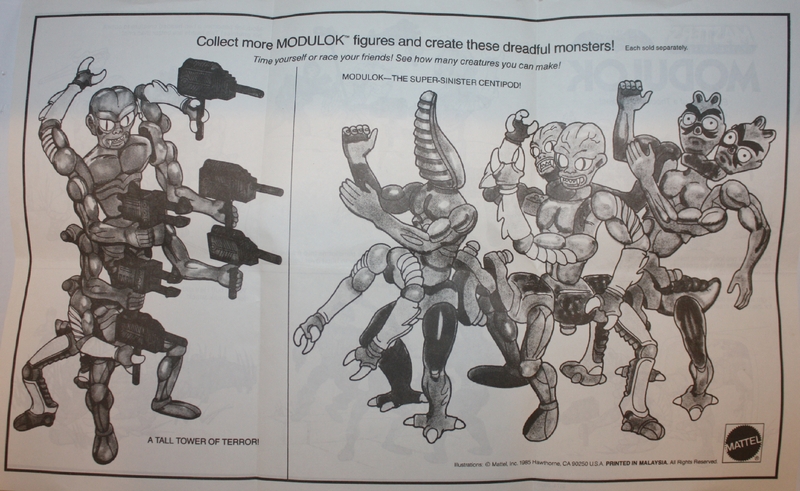 mini comic was included with the toy (although not in the Top Toys example above), and as mentioned previously, depicted Modulok with his concept design rather than his final form. 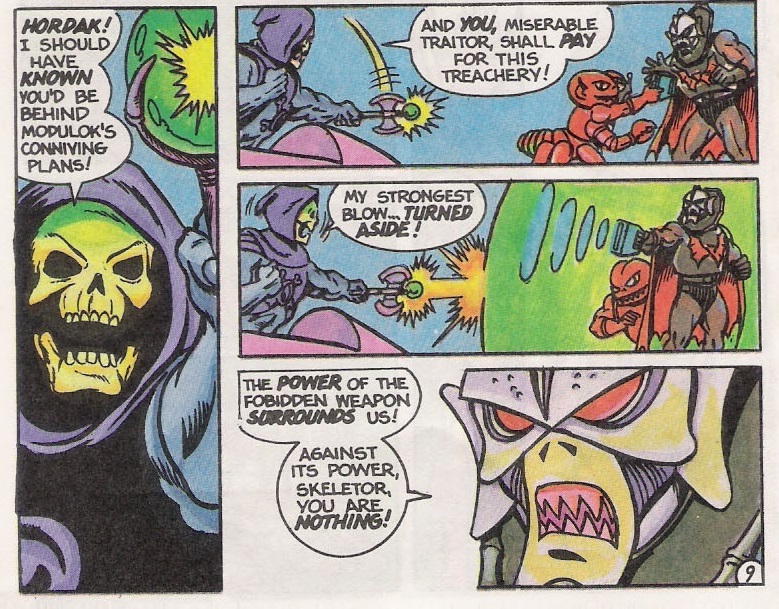 In the story, Modulok is a defector from Skeletor’s crew. He approaches Hordak with a plan to infiltrate Castle Grayskull. In a rather gruesome and devious plot, he mails his body parts to the heroic warriors, who are baffled by them. After the heroes leave his parts unattended, Modulok assembles himself and wreaks havoc on the unsuspecting heroes. 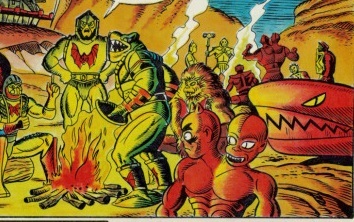 Modulok is the only member of the Evil Horde without the Horde bat insignia (with the exception of Multi-Bot, who was something of a robotic sequel to Modulok). It may be that his inclusion in the Horde faction was something of an afterthought. And indeed, that may also be the reason he is depicted as non-original member of the group in the mini comic and other media. 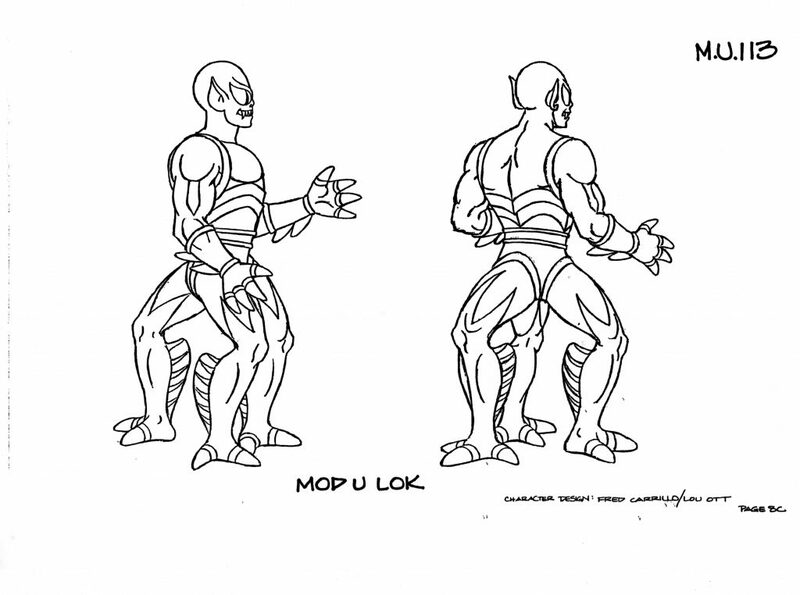 Modulok’s back story is spelled out succinctly in Mattel’s official style guide (with artwork by Errol McCarthy). These origins don’t appear to have anything to do with the story in the mini comic. Formerly Galen Nycoff, evil scientist. 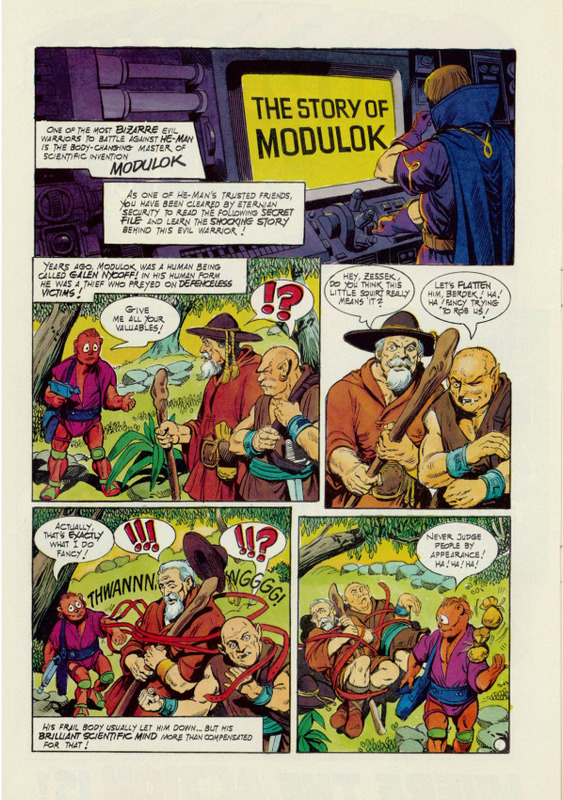 He constructed a device while in prison to help him become the most deadly villain on Eternia, and emerged… Modulok! 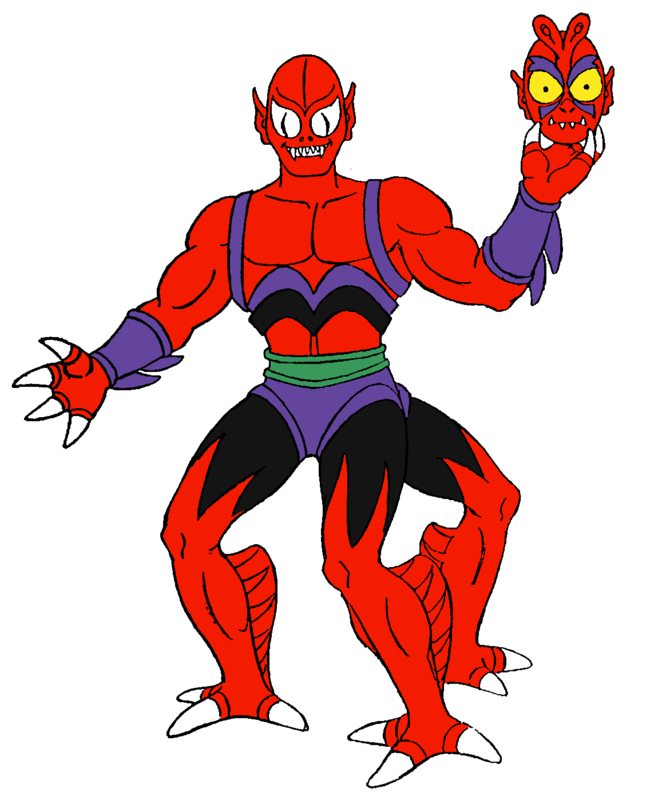 He has since allied himself with Hordak and the Evil Horde. 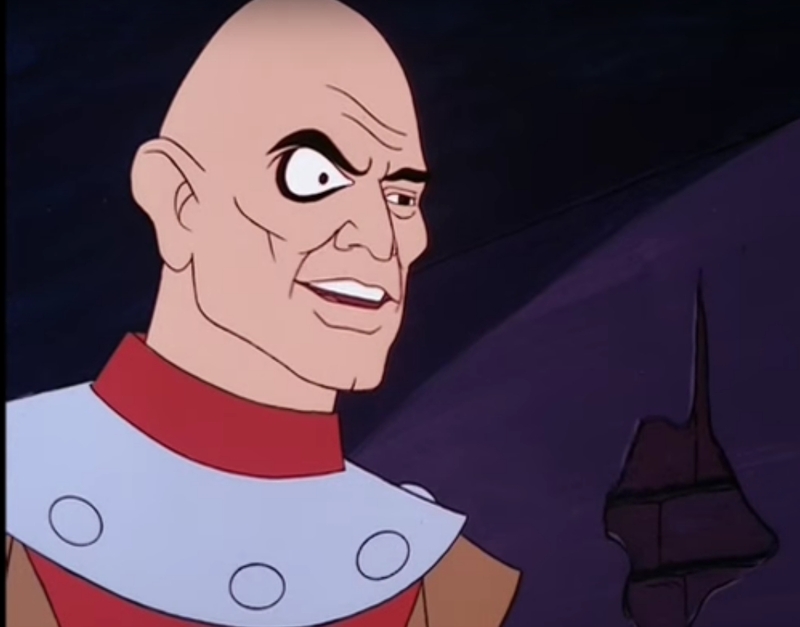 The Filmation series origin for Modulok follows the same basic formula, expanding upon it and giving pre-transformation Galen a pretty standard evil scientist look. 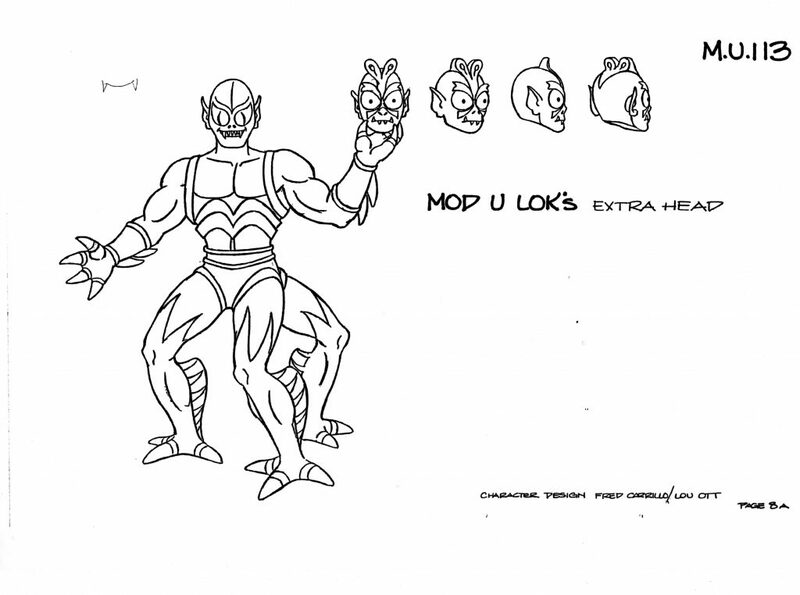 Filmation’s take on the character design was created by Fred Carillo and Lou Ott. 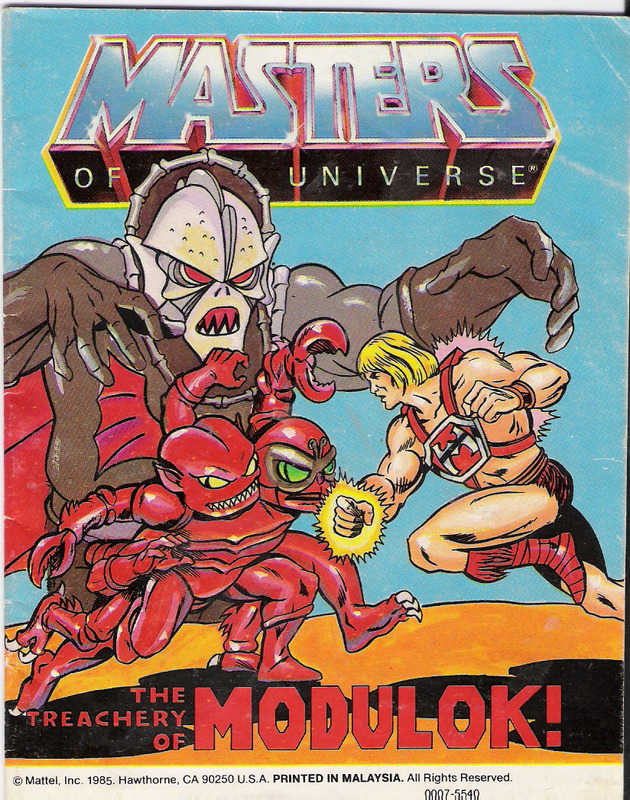 (Fred also did artwork for quite a few Masters of the Universe Golden Books story books and coloring books.) 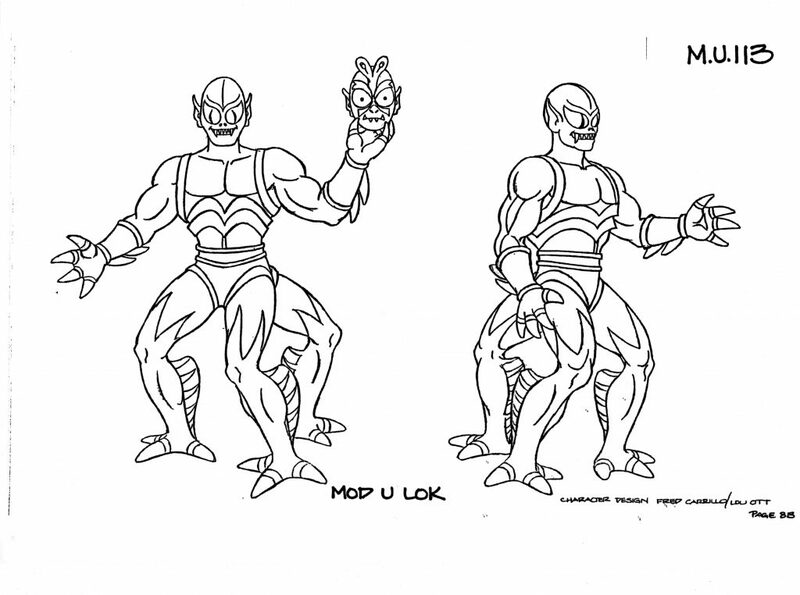 Here Modulok has been given purple shorts, a green belt, black markings on his legs, and some modifications to the design of his chest and hands.He is always depicted with three legs. Modulok also makes several appearances in posters by William George, Earl Norem, and others. 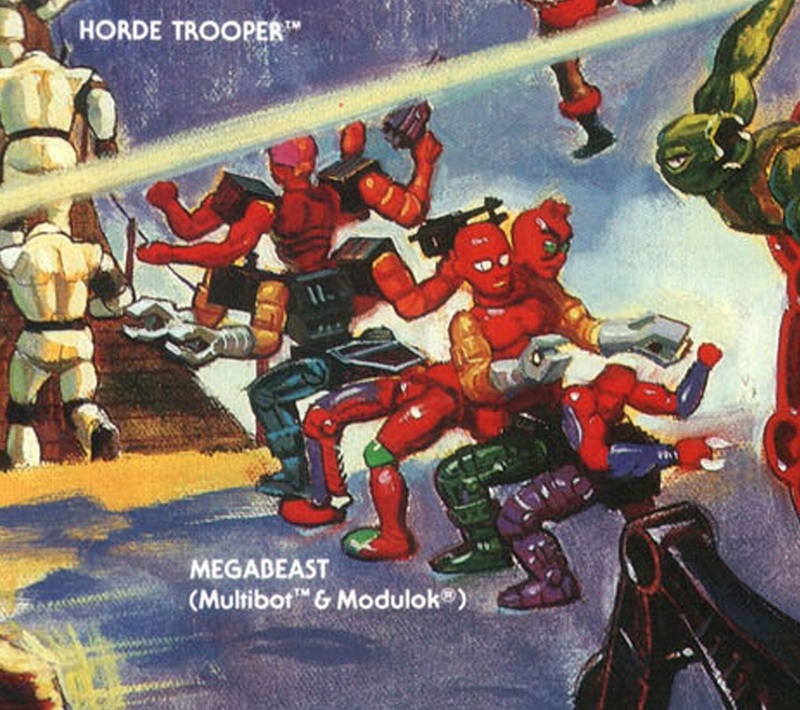 Notice in the last example below (from William George’s Eternia poster) that Modulok has been combined with Multi-Bot to form “Megabeast”. Masters of the Universe meets Lego – who would have found that possible, let’s say in 1983? 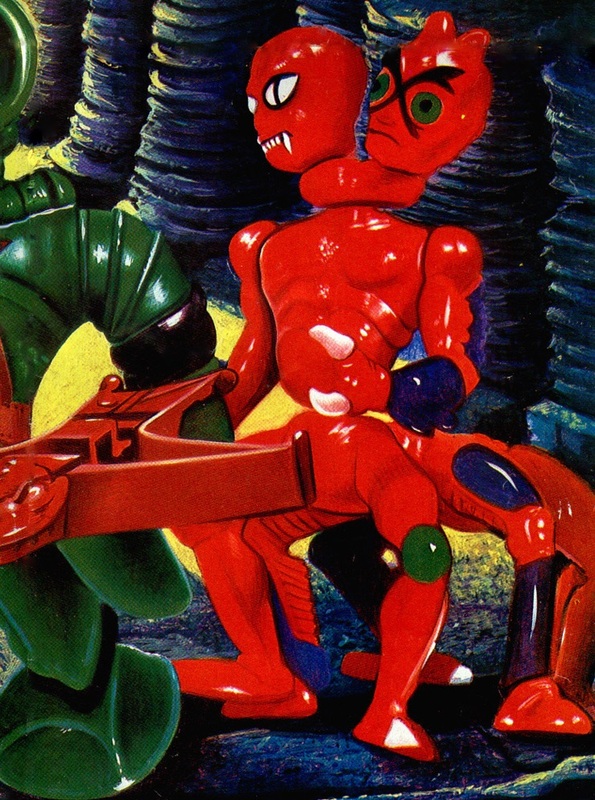 Lego was for small kids which – once they became older – would think of MotU being for the cool kids. At least that was how my friends and I would look at things back then ;-). always a great design idea. 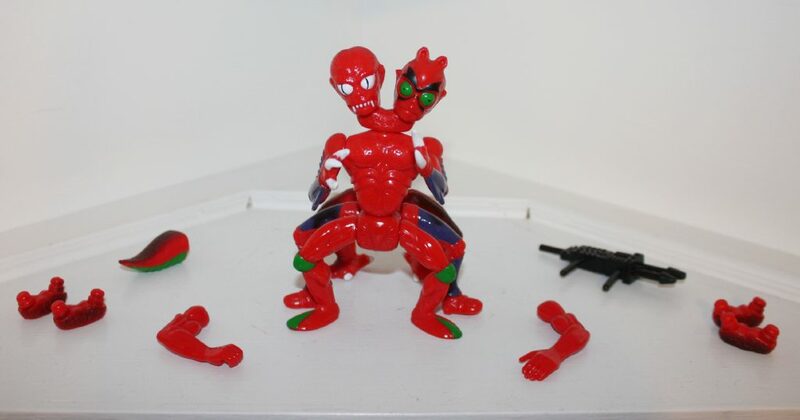 the odd bit of course being how come the Evil Horde got two of these (Modulok and Multi-bot) and no-one else got any? for such an idea, seams a bit unbalanced. 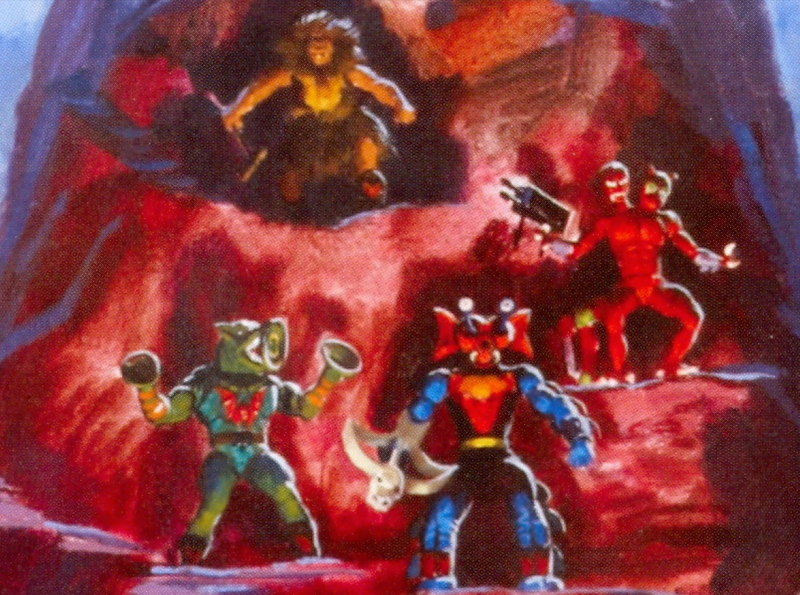 of course, it’s not the case that every side gets everything by a long shot, but there is often some kinda balance with such gimmicks like Battle Armour He-man -> Battle Armour Skeletor, Stridor->Night Stalker, Battle Cat->Panthor, Greyskull->Snake Mountain, -Rotar>Twistoid Road Ripper->Land Shark for examples..
for some reason, just remembered/noticed.. Megabeast cheats.. I’m pretty sure you can’t make that with only one of each character. you need atleast two Mutilbots. Great article!! I always wanted Modulok, but alas he always slipped through my grasp. Good job as always!! As far as Modulok’s legacy, it is a bit weak considering Multi-Bot came out as well. Great article, as always, in many ways I wished I knew what went into the background of making Modulok back then and I would have been interested in getting him. Excellent discussion. 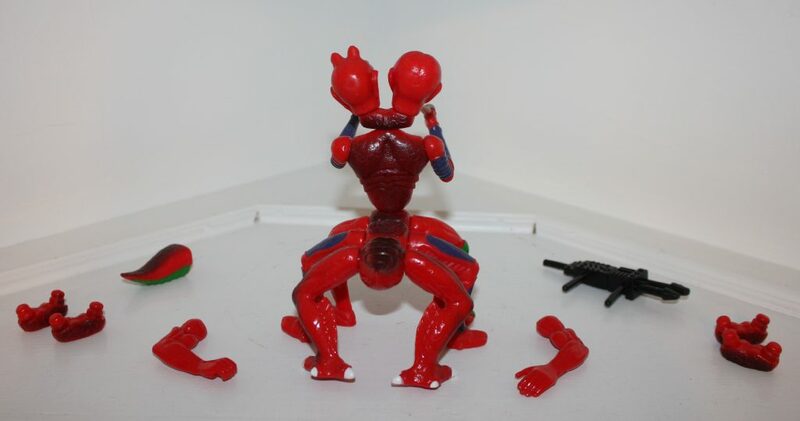 I was thrilled with Modulok as a kid. 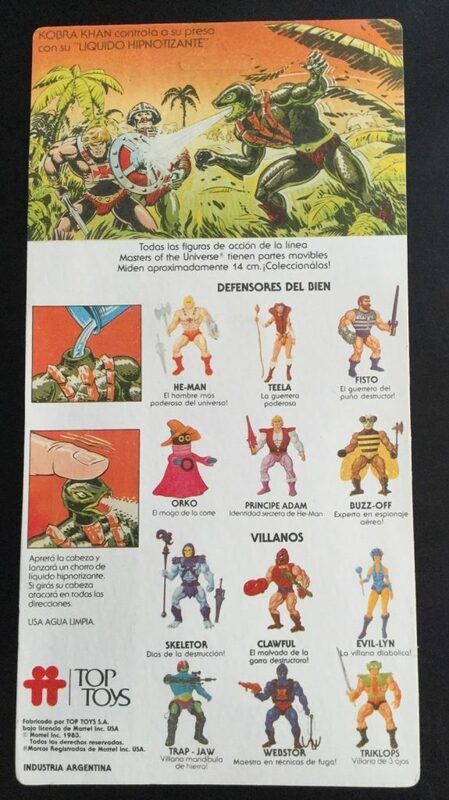 Long before he came out, I was 7yo and noticed that Mattel would list names of figures at the bottom of the backs of mini-comics, and that this was often a source of info about upcoming figures. This was of course a way to put the names into print to protect copyright/trademerk claims. I paid very close attention to this stuff. 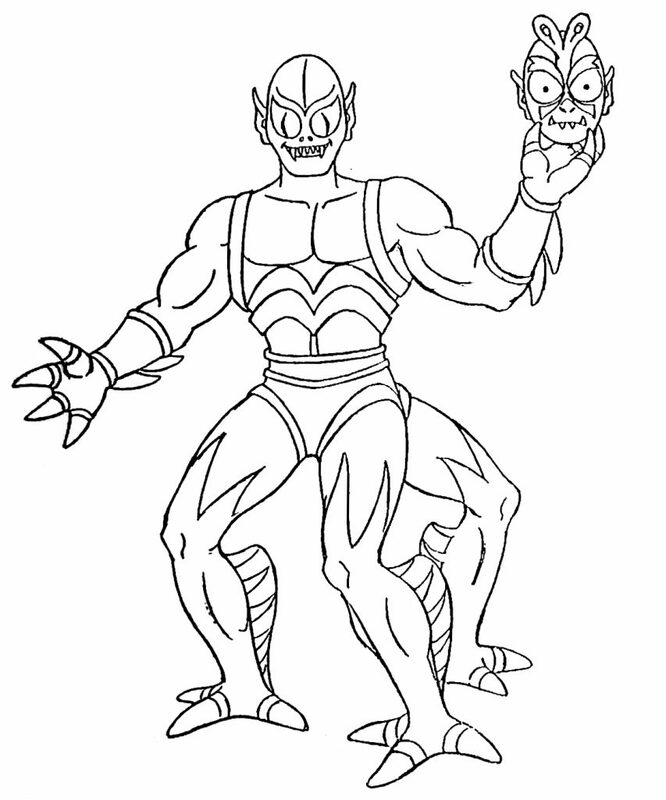 I remember the first moment I ever heard of Modulok: I was sitting on the toilet in my mother’s bathroom thumbing through a MOTU coloring book she had just brought home, and there he was, depicted as one of Skeletor’s minions. 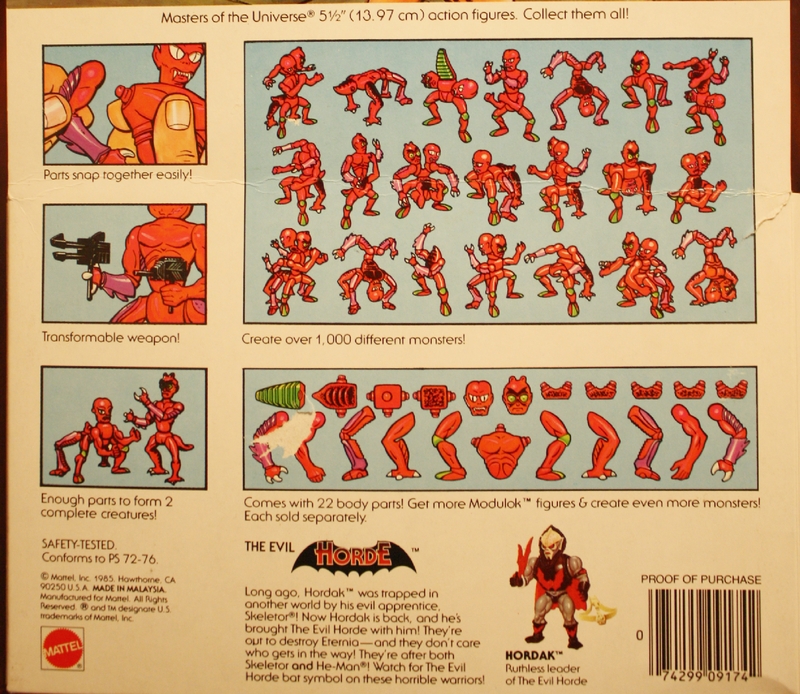 This was long before any mention of the Evil Horde, and long before he actually hit the shelves. Super great blog! 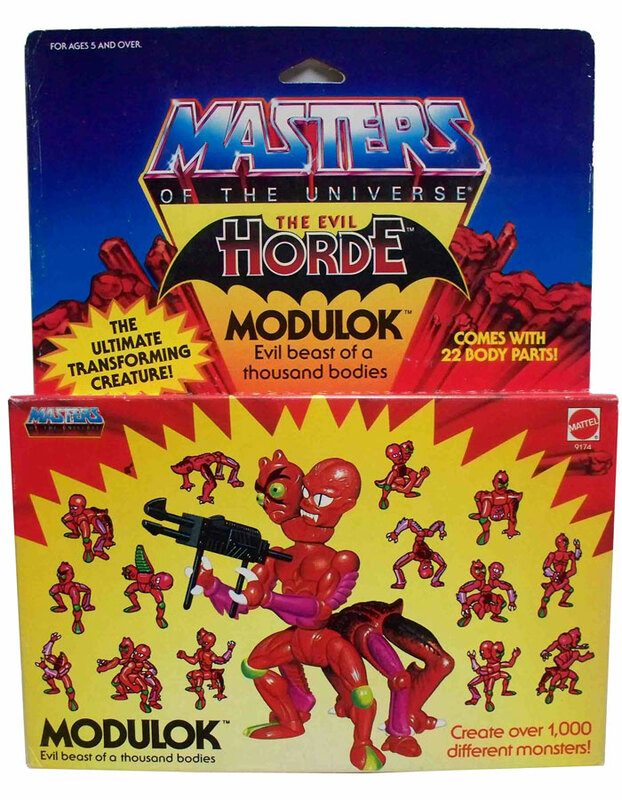 Damn I was a He-Maniac back in the day and I just loved Modulok!!! When Hordak was introduced He-man got even better! !